With Harley-Davidson’s incredible goal of 100 motorcycle models by 2027, H-D brings you the latest and newest motorcycle models to add to their 2018 Harley-Davidson motorcycle model line up the 2018 Harley-Davidson Iron 1200 & Forty Eight Special! Featuring Throw-back Styling, High Handlebars, Cool Graphics, and Garage-Built Attitude built on the Evolution 1200 V-Twin engine. New fuel tank graphics distinguish both the 2018 Harley-Davidson Iron 1200 & Forty Eight Special, and combine bold color stripes with a formal typeface, color and graphic elements originally popular in the 1970s. The 2018 Harley-Davidson Iron 1200 & Forty Eight Special… Future classics. Each model review features pages of unique editorial content, key features, USA/Canada/European specifications, MSRP and much more. 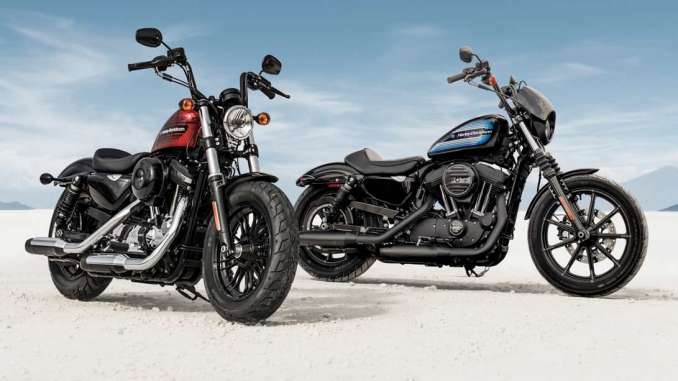 So check out the 2018 Harley-Davidson Iron 1200 & Forty Eight Special right now, you’ll be happy you did. The 2018 Motorcycle Model Guides, brought to you by, Total Motorcycle. If you are not seeing the new Total Motorcycle 2018 Harley-Davidson Motorcycle Lineup, then you are not seeing the very best.